A drawing of an elderly man, standing in profile to the right, whose head recalls the grotesque profiles. His flowing hair is bound with a band. He wears a long coat with large sleeves and a hood, and carries a roll in his right hand; numbered '12' on the verso. 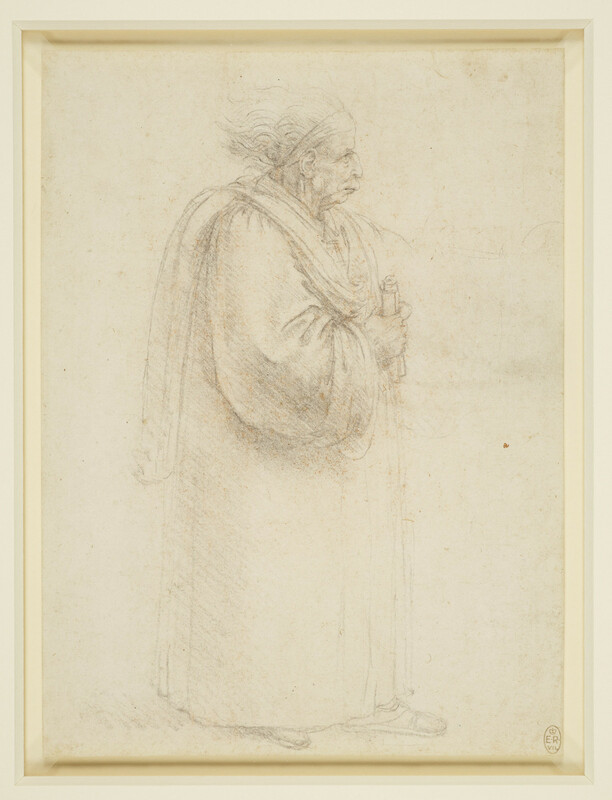 This drawing of an old man wearing robes and holding a scroll has been interpreted as a caricature of a lawyer or academic. The head of the figure was copied, along with others from the Windsor album, on a sheet now at Chatsworth, inscribed '21 September / 1626 / at Hatfld / da Leonard'. That inscription is the earliest evidence of the Windsor album's presence in England, but how it came to be at Hatfield House (if that is the implication of the inscription), residence of William Cecil, 2nd Earl of Salisbury, is unclear. The figure also appears (half-length and in reverse) in an etching by Wenceslaus Hollar of 1648, one of 38 by Hollar after drawings by Leonardo now in the Royal Collection, and the first reproductions of those drawings in print. These prints were published between 1645 and 1665, after Thomas Howard, 2nd Earl of Arundel had left England in 1641-2 (and most after his death in 1646); two bear the inscription 'ex collection Arundeliana'. It is unlikely that Arundel took his album of Leonardo drawings into exile on the Continent, and it is probably that Hollar's etchings were based on drawings he had made earlier in London.